Hi, my name is Dek and I'm a freelance guide in Bali for French and English-speaking guests. I am very proud of my culture and am excited to welcome you to my village - Bona Village - in the Gianyar regency, which is famous for its arts & culture. 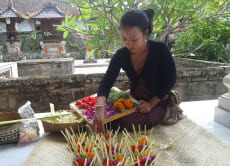 There are always many activities going on in my village, and we love sharing our lives with visitors, so come stay with us for a uniquely Balinese experience. I look forward to seeing you soon!